Wordless Wednesday – Holiday Fun! Categories: Bryson, Family, Holidays, Matthew, Preschool, Wordless Wednesday | Permalink. 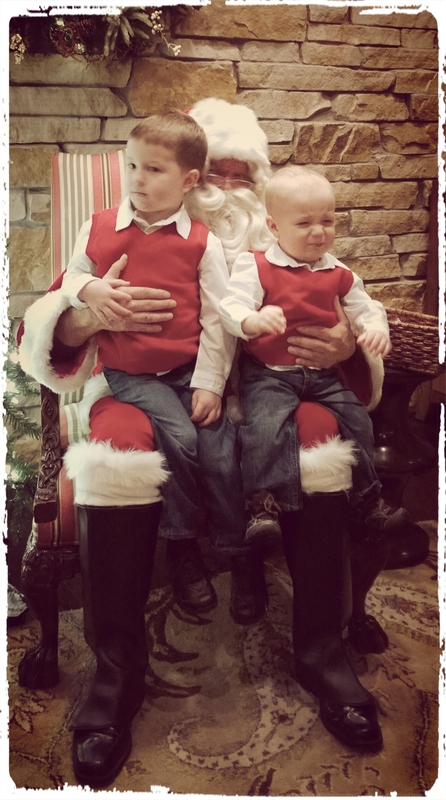 Wordless Wednesday – Not An Easy Year for Santa Photos! Categories: Bryson, Holidays, Matthew, Wordless Wednesday | Permalink. I ran an 8 mile trail race today, and about 2.5 miles in, and 10 seconds after my friend told me about her first spill on this particular trail, I tripped on a rock and was airborne. I landed on my left shoulder before slamming my face into the ground. It hurt… It hurt a lot. But, it was nice and chilly so my face went numb pretty quickly. I laid on the ground a bit to be sure nothing was seriously wrong, but I thought I’d broken my nose. There was blood and pain and the most horrid gasps from passersby. So many people stopped to help and their looks scared me more than anything. As my BIL approached, I asked my friend to go back and prepare Hottie before he saw me. I didn’t want him freaking out at the sight of me on my back covered in blood. Hottie was concerned and wanted to call for transport but I said no. No, no, no – I’m fine! An awesome older guy (grandpa age) stopped and told me I was prettier with the dirt in my face, checked me for a concussion, and patted my knee as he announced that I was “good to run.” Hottie obliged and we all walked 5 minutes before I took off again. It felt good to pass a lot of the folks who passed as I was on the ground, and it felt good to up my pace as we progressed. Before we knew it, we had just a couple of miles left. Easy peasy! As I crossed the finish line, there were quite a few gasps, lots of high fives, and big kuddos from the race director. It was embarrassing, but also empowering. Most people couldn’t believe I finished. I finished with a 10.5 minute pace which was under my goal (when we took out our 7 minute pause for my injury) and that’s a respectable pace for a single track trail race. I was thrilled! I wanted to finish in 1:27 for 8 miles and finished the exact 7.65 miles in 1:25:42 before the 7 minute removal. Another race in the books, another major injury averted. Win win (even if I didn’t really win)! Categories: Adventures!, Fitness and Health | Permalink. There are only two left to do after this one – a moose and mountain scene for Matthew’s room, and a heart one for Valentines Day. Then I’m done… For a while, anyway… We’re running out of places to put these! Categories: Holidays, My Free Time | Permalink. Wordless Wednesday – Getting Sh*t Done For the Holidays! Categories: Bryson, Family, FUN!, Holidays, Wordless Wednesday | Permalink.